The ‘pot min’ connection on the Uni controller is directly connected on the component side of the circuit board to the battery -ve. In the event of a wiring fault that causes excess current to flow through the pot earth, a topside track can fuse. For instance, a pot contact could touch on a live battery wire. If this track fuses, the pot will not operate correctly, but the track alone fuses – no damage is done to the board. This track connects the speed pot min pin to the zero end of the gain preset. To repair the track, connect a fine wire (a single copper strand from a 7/02 wire will do) as shown by the green wire above. 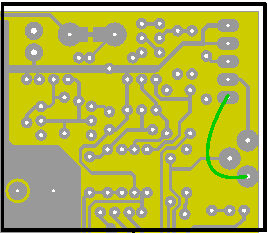 This shows the corner of the board beneath the pot connector and gain control. Be warned that if this wire is too thick and the same fault occurs, you may fuse the thick copper track that connects (around the periphery of the component side of the board) the gain preset to the B- line. If this track blows, major electronic damage will ensue. Ideally you should use a self-resetting fuse, FSR-090, to repair the track.